Which Window Treatments are Best for Your Kitchen? When you think about improving and renovating your kitchen, your mind most likely wanders to cabinets, appliances, flooring, and countertops. While these major elements are essential to any kitchen update, don’t forget about other smaller details that can also contribute to the atmosphere you want to create in your home. Window treatments, for example, are very important but frequently neglected elements of kitchen design. Depending on the layout of your home, it’s possible that your kitchen receives full sunlight in the morning or afternoon. 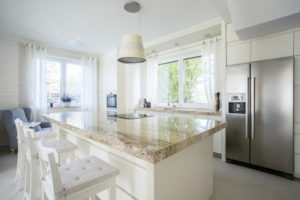 While the warmth of the sun can certainly be nice, full exposure on a hot day can cause your kitchen to feel uncomfortable and essentially blind you for the period of a few hours. Fortunately, this problem is easy enough to fix with window blinds that can be raised and lowered from the top or bottom as needed. This type of flexibility makes it possible to block the sun as it moves through the sky, keep your kitchen useful and comfortable, and then utilize the full span of your window once the sun has moved out of the way. In addition to practicality, you also want to add a layer of elegance and aesthetic appeal to your kitchen’s window treatments. A valance and a Roman shade in the same fabric can have this effect, as can a valance mounted above the window in an attractive color palette or pattern. Flat Roman fabric shades offer your kitchen a sense of classic appeal that few other window treatments can. The design is soft and stylish yet also functional, especially for protecting interior furnishings and materials from damaging UV rays. You can pull the shades down during prime sunshine hours, then snap them back up to reveal the views outside your kitchen window. Whatever choice you make with your kitchen window treatments, Kitchen Creations Cabinet and Countertop Specialists in Tampa, Florida can help. The experts at Kitchen Creations specialize in Tampa kitchen remodeling, so you can call (813) 964-9576 to receive all the guidance and professional support you need to design and build the kitchen of your dreams. ©2019 Kitchen Creations. All rights reserved.